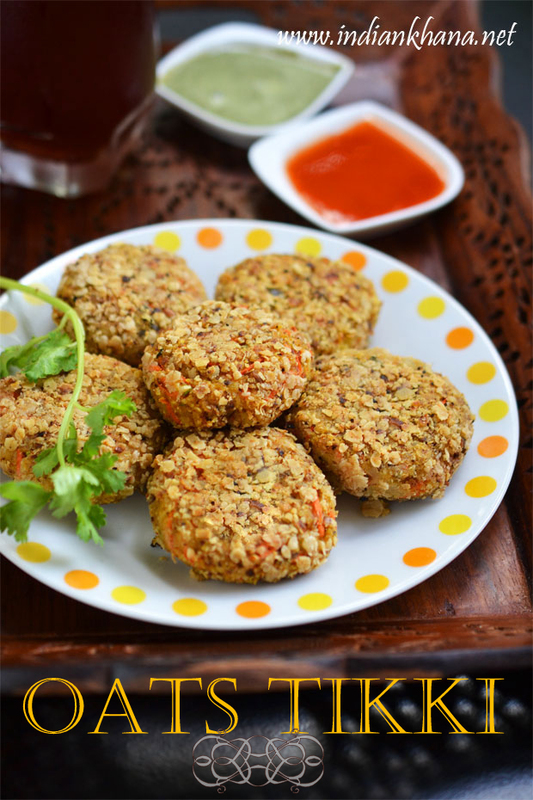 Oats Tikki or oats cutlet is easy and healthy snack made with oats, potato and spices. This is healthy snack for kids, adults and specially for Iftar now during Ramazan too as it's very filling. 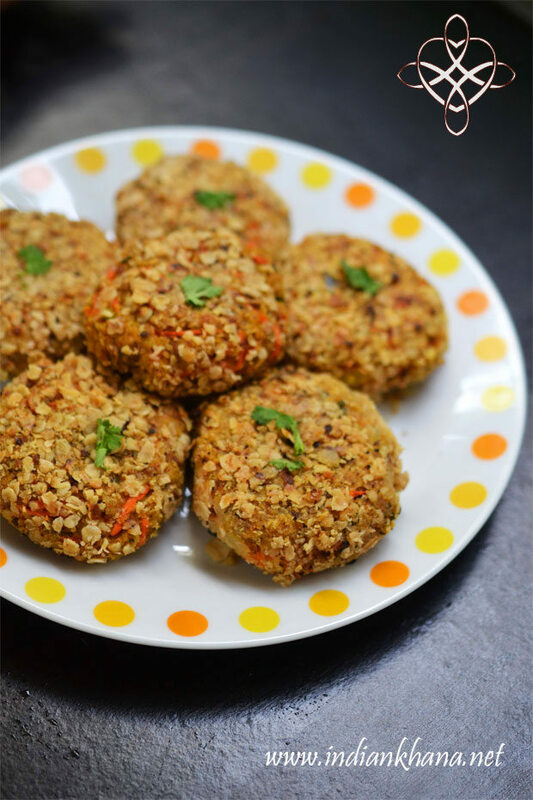 I make oats mostly for breakfast or as quick lunch for myself, this cutlet I made few times before with slight different variations but this is one recipe that I like the most and I make this specially for guests if want to serve something healthy and different. 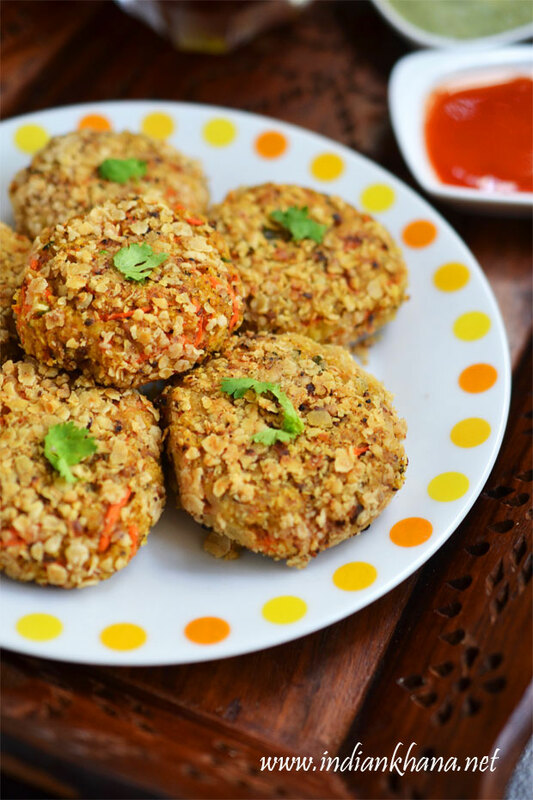 This oats cutlets makes very good for kids snacks or lunch box or for your party it's wonderful too, best thing is we can prepare the tikki and keep in fridge for 1 day or freeze it too just shallow fry them whenever we can ready to serve. I haven't tried deep frying these oats cutlet but if you making this in large patch for party then you can deep fry it but personally I make my cutlets to be pan fried than deep fried. I have added carrot but we can add any other vegetables of choice, I was so tempted to add beetroot but then beetroot gives dark pink color so I didn't added this time if you wish you can add grated beetroot, cabbage, onions etc butI wanted to make no onion no garlic recipe so I didn't added onion too. Also you can stuff these cutlets with little cheese piece or 1 tsp of grated cheese or finely chopped peanuts, cashew or raisins etc for extra crunch. 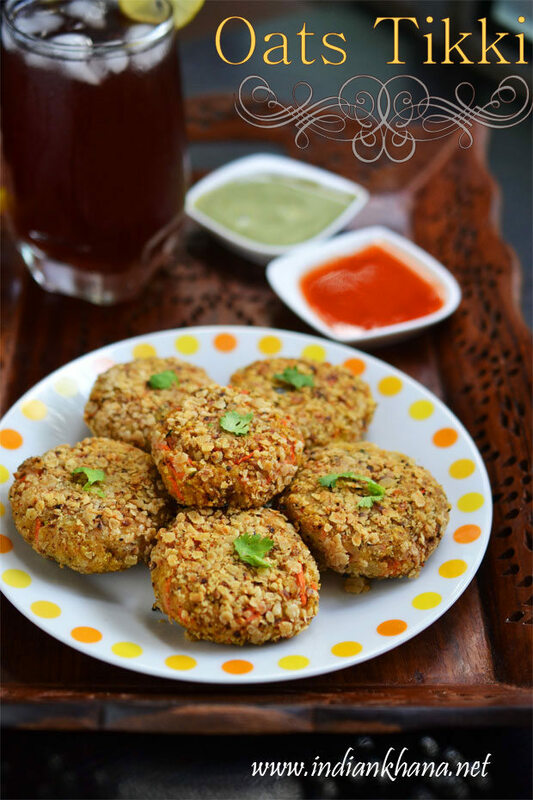 If you wish you can avoid coating cutlets with oats and replace it with bread crumbs too. 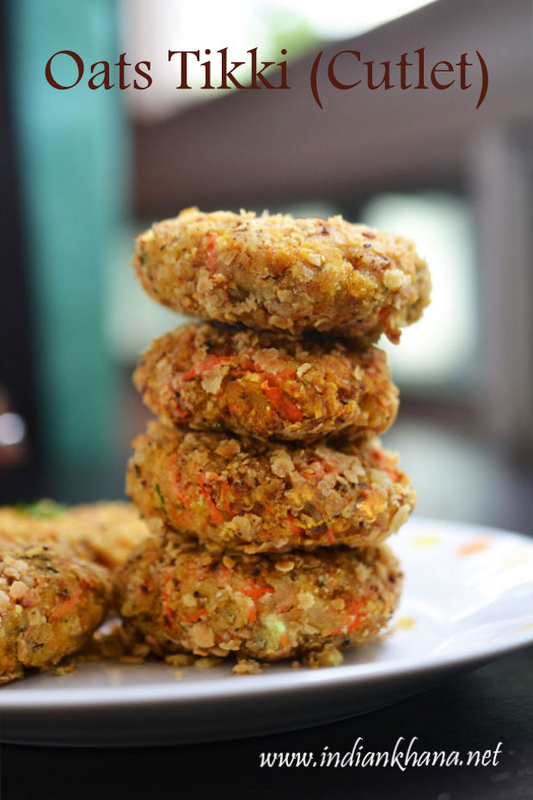 I am getting Iftar Snacks recipes request so this time I manage to quickly take pictures to share this healthy cutlet with you all, try this and you will like it too. Aromatic Oats cutlet with mashed potato and spices. Boil potato in pressure cooker for 3-4 whistles, once pressure released peel and mash or grate potatoes. Grating is good option to get potato without any lumps. While potato is getting pressure cook, roast all the oats (1 1/2 cups) until light brown, keep stirring to avoid burning, keep aside 1/2 cup of oats. Peel and grate carrot, finely chop green chili, coriander leaves. In a large bowl take mashed potato, oats, carrot, green chili, coriander leaves turmeric powder, red chili powder, fennel powder, cumin powder, salt, chaat masala, garam masala, lemon juice and mix everything well to form smooth dough, oats will works as binding agent perfectly, if you are not able to bind all the ingredients add more 1 to 2 tbsp oats or as required. You can also add bread crumbs. Divide the dough into 12 to 14 pieces and shape them into round, oval or any shape you prefer with 1/2 inch thickness. In a small bowl mix maida, water to smooth paste without any lumps and in another plate spread reserved oats. 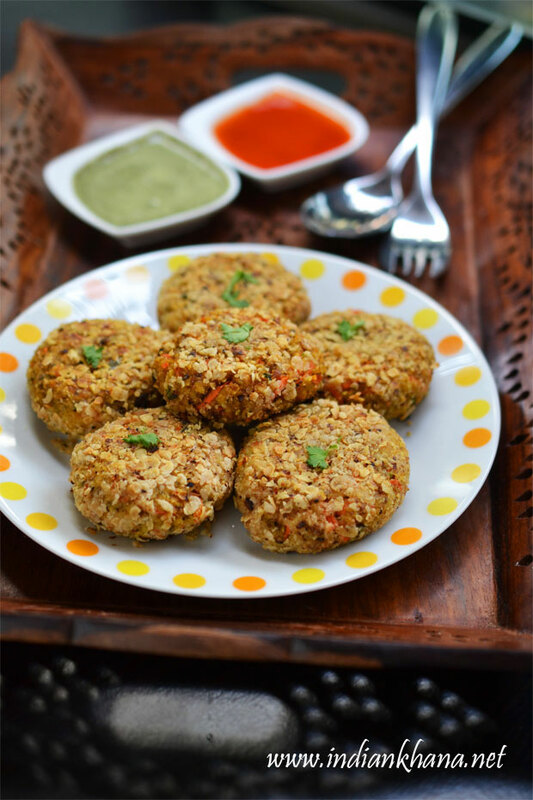 Dip tikki (cutlet) into maida mixture covering all sides quickly and then roll them in oats spread. Do not keep tikki in maida mixture for long or it will absorb moisture, repeat for rest of tikkis. Heat a pan or tawa add 1 to 2 tbsp oil and place 4 to 6 tikki (depends on your pan size), do not over crowd them and cook in slow to medium flame until golden brown, flip cutlets to another side add again 1 to 2 tbsp oil and cook until golden brown again, drain in kitchen tissue and do for remaining batch. Serve hot with ketchup, sauce or green chutney, sweet chutney. You can add finely chopped onion, capsicum, grated beetroot too. Roast oats nicely to avoid stickiness, you can also keep tikki in fridge for 1 hour to more to firm them up or you can freeze then and fry whenever needed to serve. Instead of shallow fry you can also deep fry this cutlets if making in large batch. You can add crushed peanuts or finely chopped cashew nuts to extra crunch. Filling and delicious Oats Cutlets.